Proprietary Name: Ranitidine Immediate Release What is the Proprietary Name? 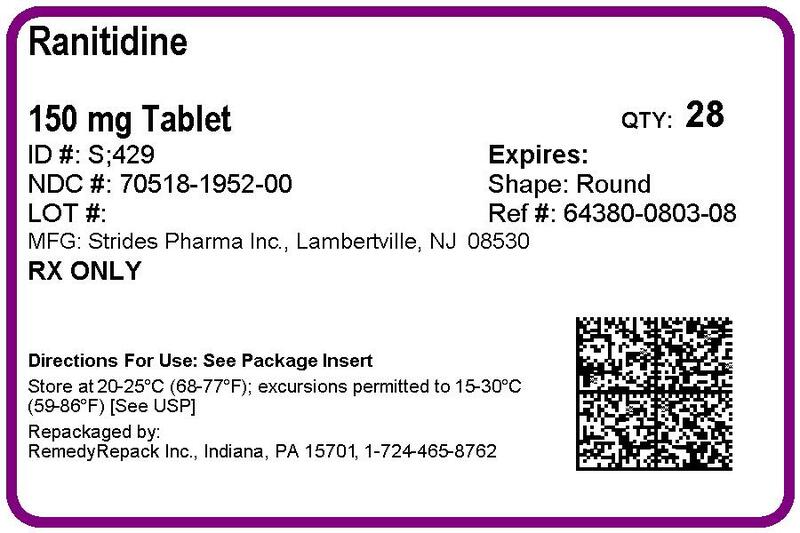 Non-Proprietary Name: Ranitidine What is the Non-Proprietary Name? Ranitidine Immediate Release with NDC 70518-1952 is a a human prescription drug product labeled by Remedyrepack Inc.. The generic name of Ranitidine Immediate Release is ranitidine. The product's dosage form is tablet and is administered via oral form. FDA Application Number: ANDA205512 What is the FDA Application Number? 3S.HCl, representing a molecular weight of 350.87. Ranitidine HCl USP is a white to pale yellow crystalline powder that is soluble in water. It has a slightly bitter taste and sulfur-like odor. Each ranitidine tablets, USP 150 mg for oral administration contains 168 mg of ranitidine HCl USP equivalent to 150 mg of ranitidine. Each tablet also contains the inactive ingredients magnesium stearate, microcrystalline cellulose, croscarmellose sodium, silicon dioxide, hypromellose, titanium dioxide, triacetin, and iron oxide red. Each ranitidine tablets, USP 300 mg for oral administration contains 336 mg of ranitidine HCl USP equivalent to 300 mg of ranitidine. Each tablet also contains the inactive ingredients magnesium stearate, microcrystalline cellulose, croscarmellose sodium, silicon dioxide, hypromellose, titanium dioxide, triacetin, and iron oxide red. 2-receptors, including receptors on the gastric cells. Ranitidine does not lower serum Ca++ in hypercalcemic states. Ranitidine is not an anticholinergic agent. Absorption: Ranitidine is 50% absorbed after oral administration, compared with an intravenous (IV) injection with mean peak levels of 440 to 545 ng/mL occurring 2 to 3 hours after a 150-mg dose. The syrup is bioequivalent to the tablets. Absorption is not significantly impaired by the administration of food or antacids. Propantheline slightly delays and increases peak blood levels of ranitidine, probably by delaying gastric emptying and transit time. In one trial, simultaneous administration of high-potency antacid (150 mmol) in fasting subjects has been reported to decrease the absorption of ranitidine. DOSAGE AND ADMINISTRATION: Dosage Adjustment for Patients with Impaired Renal Function). max are displayed in Table 1. Antisecretory Activity:1. Effects on Acid Secretion: Ranitidine inhibits both daytime and nocturnal basal gastric acid secretions as well as gastric acid secretion stimulated by food, betazole, and pentagastrin, as shown in Table 2. It appears that basal-, nocturnal-, and betazole-stimulated secretions are most sensitive to inhibition by ranitidine, responding almost completely to doses of 100 mg or less, while pentagastrin- and food- stimulated secretions are more difficult to suppress. Oral ranitidine does not affect pepsin secretion. Total pepsin output is reduced in proportion to the decrease in volume of gastric juice. Oral ranitidine has no significant effect on pentagastrin-stimulated intrinsic factor secretion. Gastric bacterial flora—increase in nitrate-reducing organisms, significance not known.Prolactin levels—no effect in recommended oral or IV dosage, but small, transient, dose-related increases in serum prolactin have been reported after IV bolus injections of 100 mg or more.Other pituitary hormones—no effect on serum gonadotropins, TSH, or GH. Possible impairment of vasopressin release.No change in cortisol, aldosterone, androgen, or estrogen levels.No antiandrogenic action.No effect on count, motility, or morphology of sperm.Pediatrics: Oral doses of 6 to 10 mg/kg/day in 2 or 3 divided doses maintain gastric pH >4 throughout most of the dosing interval. Active Duodenal Ulcer: In a multicenter, double-blind, controlled, US trial of endoscopically diagnosed duodenal ulcers, earlier healing was seen in the patients treated with ranitidine as shown in Table 3. AAll patients were permitted antacids as needed for relief of pain. In these trials, patients treated with ranitidine reported a reduction in both daytime and nocturnal pain, and they also consumed less antacid than the placebo-treated patients. A = P<0.05 (ranitidine tablets, USP versus comparator). 2-antagonists, the factors responsible for the significant reduction in the prevalence of duodenal ulcers include prevention of recurrence of ulcers, more rapid healing of ulcers that may occur during maintenance therapy, or both. Gastric Ulcer: In a multicenter, double-blind, controlled, US trial of endoscopically diagnosed gastric ulcers, earlier healing was seen in the patients treated with ranitidine as shown in Table 6. Maintenance of Healing of Gastric Ulcers: In 2 multicenter, double-blind, randomized, placebo-controlled, 12-month trials conducted in patients whose gastric ulcers had been previously healed, ranitidine 150 mg at bedtime was significantly more effective than placebo in maintaining healing of gastric ulcers. Gastroesophageal Reflux Disease (GERD): In 2 multicenter, double-blind, placebo-controlled, 6-week trials performed in the United States and Europe, ranitidine 150 mg twice daily was more effective than placebo for the relief of heartburn and other symptoms associated with GERD. Ranitidine-treated patients consumed significantly less antacid than did placebo-treated patients. In 2 additional US multicenter, double-blind, placebo-controlled, 2-week trials, ranitidine 150 mg twice daily was shown to provide relief of heartburn pain within 24 hours of initiating therapy and a reduction in the frequency of severity of heartburn. BaAll patients were permitted antacids as needed for relief of pain. Maintenance of Healing of Erosive Esophagitis: In 2 multicenter, double-blind, randomized, placebo-controlled, 48-week trials conducted in patients whose erosive esophagitis had been previously healed, ranitidine 150 mg twice daily was significantly more effective than placebo in maintaining healing of erosive esophagitis. Ranitidine tablets, USP is indicated in:Short-term treatment of active duodenal ulcer. Most patients heal within 4 weeks. Trials available to date have not assessed the safety of ranitidine in uncomplicated duodenal ulcer for periods of more than 8 weeks.Maintenance therapy for duodenal ulcer patients at reduced dosage after healing of acute ulcers. No placebo-controlled comparative studies have been carried out for periods of longer than 1 year.The treatment of pathological hypersecretory conditions (e.g., Zollinger-Ellison syndrome and systemic mastocytosis).Short-term treatment of active, benign gastric ulcer. Most patients heal within 6 weeks and the usefulness of further treatment has not been demonstrated. Trials available to date have not assessed the safety of ranitidine in uncomplicated, benign gastric ulcer for periods of more than 6 weeks.Maintenance therapy for gastric ulcer patients at reduced dosage after healing of acute ulcers. Placebo-controlled trials have been carried out for 1 year.Treatment of GERD. Symptomatic relief commonly occurs within 24 hours after starting therapy with ranitidine 150 mg twice daily.Treatment of endoscopically diagnosed erosive esophagitis. Symptomatic relief of heartburn commonly occurs within 24 hours of therapy initiation with ranitidine 150 mg 4 times daily.Maintenance of healing of erosive esophagitis. Placebo-controlled trials have been carried out for 48 weeks.Concomitant antacids should be given as needed for pain relief to patients with active duodenal ulcer; active, benign gastric ulcer; hypersecretory states; GERD; and erosive esophagitis. See DOSAGE AND ADMINISTRATION). Caution should be observed in patients with hepatic dysfunction since ranitidine is metabolized in the liver. ® may occur during therapy with ranitidine, and therefore testing with sulfosalicylic acid is recommended. Ranitidine has been reported to affect the bioavailability of other drugs through several different mechanisms such as competition for renal tubular secretion, alteration of gastric pH, and inhibition of cytochrome P450 enzymes.Procainamide: Ranitidine, a substrate of the renal organic cation transport system, may affect the clearance of other drugs eliminated by this route. High doses of ranitidine (e.g., such as those used in the treatment of Zollinger-Ellison syndrome) have been shown to reduce the renal excretion of procainamide and N-acetylprocainamide resulting in increased plasma levels of these drugs. Although this interaction is unlikely to be clinically relevant at usual ranitidine doses, it may be prudent to monitor for procainamide toxicity when administered with oral ranitidine at a dose exceeding 300 mg per day. 2-receptor antagonists with delavirdine is not recommended. Salmonella, Escherichia coli) for mutagenicity at concentrations up to the maximum recommended for these assays. In a dominant lethal assay, a single oral dose of 1,000 mg/kg to male rats was without effect on the outcome of 2 matings per week for the next 9 weeks. Teratogenic Effects: Pregnancy Category B. Reproduction studies have been performed in rats and rabbits at doses up to 160 times the human dose and have revealed no evidence of impaired fertility or harm to the fetus due to ranitidine. There are, however, no adequate and well-controlled studies in pregnant women. Because animal reproduction studies are not always predictive of human response, this drug should be used during pregnancy only if clearly needed. DOSAGE AND ADMINISTRATION: Pediatric Use). The safety and effectiveness of ranitidine have been established in the age-group of 1 month to 16 years. There is insufficient information about the pharmacokinetics of ranitidine in neonatal patients (aged younger than 1 month) to make dosing recommendations. Maintenance of Healing of Duodenal and Gastric Ulcers:The recommended oral dose for the maintenance of healing of duodenal and gastric ulcers is 2 to 4 mg/kg once daily to a maximum of 150 mg/day. This recommendation is derived from adult clinical trials and pharmacokinetic data in pediatric patients. Of the total number of subjects enrolled in US and foreign controlled clinical trials of oral formulations of ranitidine, for which there were subgroup analyses, 4,197 were aged 65 and older, while 899 were aged 75 and older. No overall differences in safety or effectiveness were observed between these subjects and younger subjects, and other reported clinical experience has not identified differences in responses between the elderly and younger patients, but greater sensitivity of some older individuals cannot be ruled out. 2-blockers, rare reports of arrhythmias such as tachycardia, bradycardia, atrioventricular block, and premature ventricular beats. 2RAs and pneumonia has not been established. see ADVERSE REACTIONS). In addition, abnormalities of gait and hypotension have been reported. 50 values in mice and rats were 77 and 83 mg/kg, respectively. see Clinical Trials: Active Duodenal Ulcer). Smaller doses have been shown to be equally effective in inhibiting gastric acid secretion in US trials, and several foreign trials have shown that 100 mg twice daily is as effective as the 150-mg dose. The current recommended adult oral dosage is 150 mg twice daily. In some patients it may be necessary to administer ranitidine 150-mg doses more frequently. Dosages should be adjusted to individual patient needs, and should continue as long as clinically indicated. Dosages up to 6 g/day have been employed in patients with severe disease. They are available in bottles of 60 (NDC 64380-803-03), 100 (NDC 64380-803-06), 500 (NDC 64380-803-07) and 1000 (NDC 64380-803-08) tablets. They are available in bottles of 30 (NDC 64380-804-04), 100 (NDC 64380-804-06) and 250 (NDC 64380-804-38) tablets.Store at 20° to 25° C (68° and 77° F); excursions permitted between 15° and 30° C (59° and 86° F) [see USP Controlled Room Temperature]. Protect from light. Replace cap securely after each opening.